How did Etsy come into your life? I was doing a search for handmade goods on the net, and voila! I pretty much just stumbled upon it. I'm SO glad I did! What was your involvement in the crafting world before stumbling upon Etsy? I've done little in the 'crafting world'...I've kept to myself for the most part. I was never involved with any crafting groups/organizations, etc. Do you have a day job? Yes, I'm a part-time English teacher, a freelance writer, volunteer, and I also write commissioned book reviews for various large publishing companies. I also make handmade soap, but do not sell that online (only locally). Add to that website & graphic/logo design, being a housewife, and singing harmony/backup for a recording studio, and you've got it just about right! What advice would you give to newbies on Etsy or in the crafting world? If you are looking to start selling your craft as a source of income, it's very important to do your homework. Research everything! And most definitely calculate the cost before starting. A hobby is one thing, but if you are counting on it as a source of income it's important to get all your ducks in a row before starting. It's hard work but can also be very rewarding. Start off small. Test the waters. Don't forget to spread the word – word of mouth is one of the best and cheapest (it's free!) advertisements. Tell others about what you do, because enthusiasm for your product really goes a long way and is contagious. Most importantly: DO WHAT YOU LOVE! And have fun with it! What's the most challenging part of your crafting? Finding the time (and energy) to squeeze it in, with life and health problems! Do you show your work locally? Only once, at a small craft show...but I'm hoping to do more as time permits. Famous last words? Mine? I'm scared to say, that they may actually be my last! How did you get interested in bookmaking? My love of books started at an early age. After reading The Diary Ann Frank at the age of 10, I started keeping journals, which I've done every year of my life since. I've always believed that "journal writing is a voyage to the interior." I remember collecting and obsessing over journals. And guess what? I still do! In my quest for the 'perfect' journal over the years, I decided to create my own, and share my love of the blank-book with others. That was a little over a year ago. 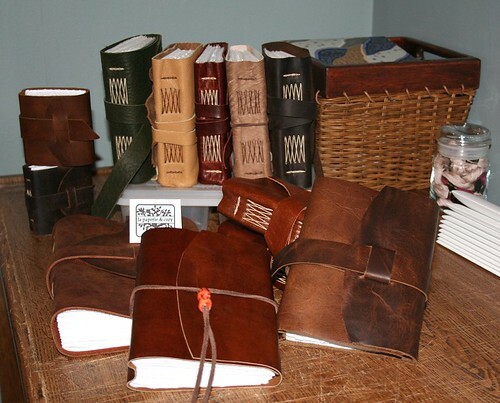 Leather journals have always been my diary of choice, and so I engaged in a self-study of non-adhesive bindings with limp leather covers. I spent about 2 months with my nose between the pages before I mustered up the courage to even try making something. As nervous as I was at the prospect of failure, I knew it was something that I would definitely love to do. Et voila! As soon as I had begun, I was hooked! After a few custom orders from family and friends, and at the suggestion of many, I decided to give my handbound books a wider wing-span, and offer them on my Etsy shop. It has also been a pleasure incorporating my love of books into the mix, offering journals with quotes from various literary greats such as Austen, Bronte, Dickens, Shakespeare, Dickinson, Hugo, Poe, Hemingway, etc. Of course, no journal is worth more than the words they store. How long have you been crafting? Bookmaking? Crafting - out of the womb. 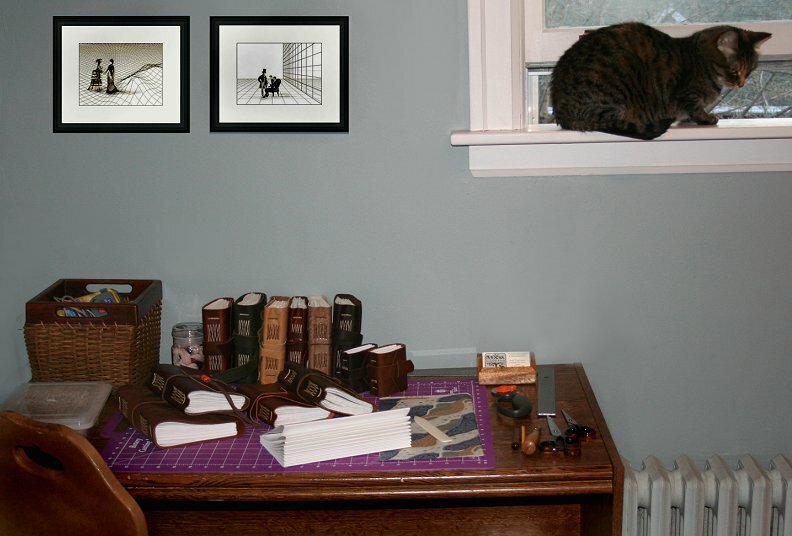 ;-) Bookbinding - about a year now. I've also sold some artwork over the years. What is the one tool or supply that you couldn't live without? my bonefolder --- la la love it! What inspires you? Many many things! With my journals I'd have to say it's my favourite classic authors and my great ardor for books in general. 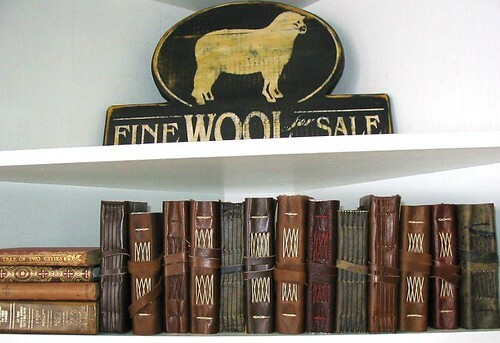 I can almost imagine literary greats of centuries past writing in handmade journals like these... Jane Austen writing notes as she walks in the pretty wilderness behind her house, annotating her next great work, Pride & Prejudice. Or a young Charles Dickens reminds himself in his journal to incorporate the comic villainy of Mr. Jingle in his first novel, The Pickwick Papers. Inspired by these literary masterminds, my journals' first pages pay homage to these outstanding writers and some of their best quotes! When it comes to my art, I'm inspired by the simplistic beauty that is in everyday objects and situations. Who is your crafting hero? My Dad. He can make just about anything out of whatever he has on hand. (We call him the Chinese MacGyver!) He's can also paint like nobody's bid'ness. His Chinese landscapes and scenes are breathtaking. Guilty pleasure? Kitty talk. Taking time off of work to...bind books. ;) Keeping some of my handmade soaps for myself. Also, hoarding books (a lot of them). What would *I* do with a journal?